Draft: 1994, Texas Rangers, 3rd rd. November 3, 2012 CF Scott Podsednik elected free agency. August 10, 2012 Boston Red Sox signed free agent CF Scott Podsednik. August 2, 2012 Arizona Diamondbacks released CF Scott Podsednik. July 6, 2012 Boston Red Sox optioned CF Scott Podsednik to Pawtucket Red Sox. June 29, 2012 sent CF Scott Podsednik on a rehab assignment to Pawtucket Red Sox. June 19, 2012 Scott Podsednik roster status changed by Boston Red Sox. May 22, 2012 Boston Red Sox selected the contract of CF Scott Podsednik from Pawtucket Red Sox. May 12, 2012 Philadelphia Phillies traded CF Scott Podsednik to Boston Red Sox for cash. May 12, 2012 Scott Podsednik assigned to Pawtucket Red Sox. April 9, 2012 Scott Podsednik roster status changed by Lehigh Valley IronPigs. April 5, 2012 Lehigh Valley IronPigs placed OF Scott Podsednik on the temporarily inactive list. April 4, 2012 OF Scott Podsednik assigned to Lehigh Valley IronPigs. November 30, 2011 Philadelphia Phillies signed free agent OF Scott Podsednik to a minor league contract and invited him to spring training. 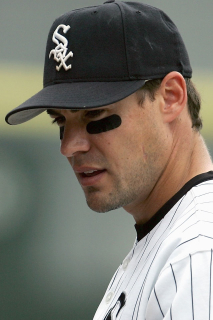 November 2, 2011 CF Scott Podsednik elected free agency. October 12, 2011 OF Scott Podsednik assigned to Tigres de Aragua. September 3, 2011 Lehigh Valley IronPigs activated CF Scott Podsednik from the 7-day disabled list. August 25, 2011 sent CF Scott Podsednik on a rehab assignment to GCL Phillies. June 11, 2011 Lehigh Valley IronPigs placed CF Scott Podsednik on the 7-day disabled list. Sprained left foot. May 28, 2011 CF Scott Podsednik assigned to Lehigh Valley IronPigs from Philadelphia Phillies. May 27, 2011 Philadelphia Phillies signed free agent CF Scott Podsednik to a minor league contract. May 11, 2011 Las Vegas 51s released CF Scott Podsednik. April 25, 2011 CF Scott Podsednik assigned to Las Vegas 51s from Dunedin Blue Jays. April 22, 2011 Scott Podsednik assigned to Dunedin Blue Jays from Las Vegas 51s. April 4, 2011 Scott Podsednik assigned to Las Vegas 51s from Toronto Blue Jays. February 16, 2011 Toronto Blue Jays signed free agent LF Scott Podsednik to a minor league contract and invited him to spring training. November 7, 2010 LF Scott Podsednik elected free agency. July 29, 2010 Kansas City Royals Traded LF Scott Podsednik to Los Angeles Dodgers; Los Angeles Dodgers Traded C Lucas May to Kansas City Royals and Great Lakes Loons Traded RHP Elisaul Pimentel to Burlington Bees. January 8, 2010 Kansas City Royals signed free agent Scott Podsednik. November 5, 2009 LF Scott Podsednik elected free agency. May 1, 2009 Chicago White Sox selected the contract of LF Scott Podsednik from Charlotte Knights. April 16, 2009 Charlotte Knights signed free agent Scott Podsednik.